Notifications are alerts you receive when somebody does something within Storypark that demands your attention. For certain actions, you'll also receive an email notification. The types of notifications you'll receive will depend on a few factors; whether you’re a teacher, a parent or a family member, an admin or non-admin. In-app notifications show up as a little number in a red speech bubble next to the Storypark duck at the top of the page. This represents the number of notifications you have waiting. Clicking this will show you a dropdown of your latest notifications and clicking 'See all notifications' at the bottom of this take you to your Notifications page. With some types of notifications, you can also be sent an email to let you know about it. You can choose which types of notifications you receive or unsubscribe from all of them. 3. You’ll be taken to a form where you can edit your email notification settings. You'll see a series of checkboxes. By checking or unchecking each box you can choose the types of notification emails you receive. 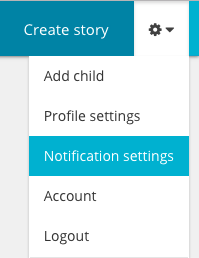 If you are a teacher and you have 'Admin' permissions you'll receive all notifications from your service. However if you're a non-admin assigned to a specific room you'll only get notifications for that room. If you do not wish to receive any emails from Storypark, you can check the 'Unsubscribe from all email notifications' option at the bottom of the page and tap 'Save my preferences'. If you'd like more control over what you receive, you can set up filters in your email so that when an email is received from Storypark, it automatically gets taken out of your inbox into a folder named, eg. 'Storypark'. You could for example set up a filter that sorts emails by room if it mentions a room name. You can create as many email filters as you like. Email filters are particularly useful for educators at large centres and managers of groups of services. The process of setting up email filters depends on the email system you're using – each one is different. Search your email system's help area or simply Google 'Email filters' and the name of your email system to find out how.